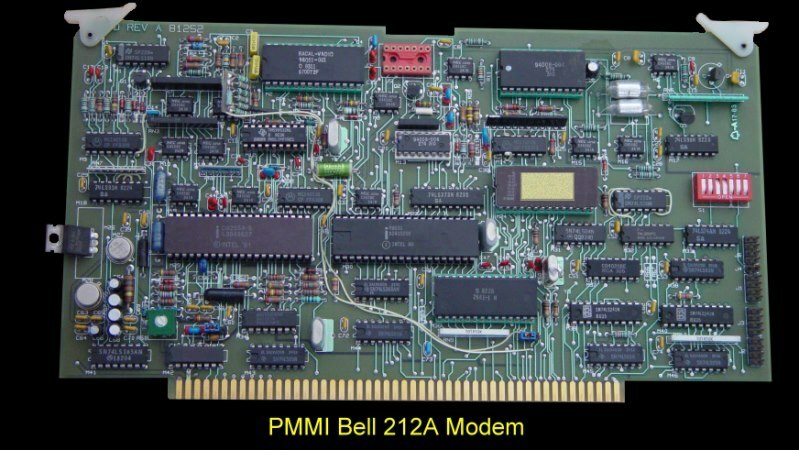 This was the next generation modem supplied by PMMI after their successful MM-103 modem. The PMMI Bel 212A was IEEE-696 compatible. It had auto answer and auto dial capability and ran at two different rates. 45.5-300 baud and at 1200 baud. It had full and half duplex capability. As with the MM-103 it utilized four consecutive IO ports on the bus. It could also be setup to utilize the interrupt lines . As for other PNMI and Hayes boards, while some simple software was provided with the board. The vast majority utilized public domain CP/M programs like Modem 5 or 7 with this board. I do not yet have a manual for this board. If you have one please let me know. The PMMI brochure can be obtained here.